The V.I. government is at a crossroads, facing budget deficits, growing debt and an inability to borrow. Revenues have gone down due to the Hovensa closure and economic downturn. But is that the whole story? Is there room to squeeze more revenue into the government’s coffers? Trying to grow the V.I. economy, in recent years the V.I. government has used V.I. money and changed V.I. 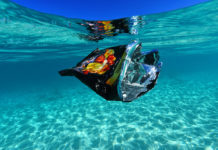 laws to expanding the rum industry, create a research and technology park at the University of the Virgin Islands to foster a local tech industry, and changed the laws to expand slot machine gambling. They tried to build hotels in the 1990s, then to help an existing hotel in Christiansted, and taken steps to try to revitalize horse racing. Major Revenue Sources – Click image for larger view. Corporate income tax receipts fell off, both in totals and in their proportion of revenues. 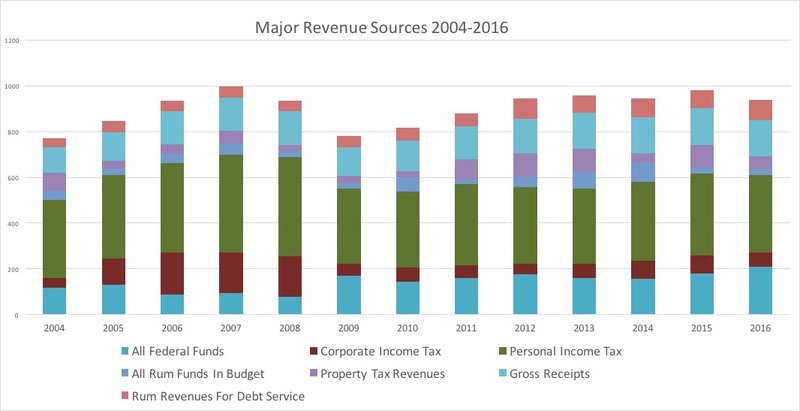 Corporate income tax receipts dropped by half, as a share of this basket of revenue sources and by more than half in total dollars, and have never risen much since, despite steady growth in Gross Receipts Tax receipts. 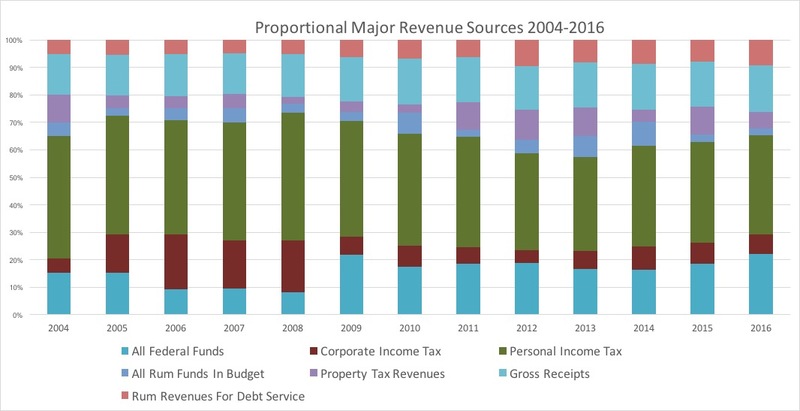 Proportional Major Revenue Sources 2004-2016. – Click image for larger view. 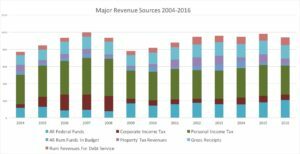 Corporate income taxes remained much lower, both in absolute terms and their proportionate share of revenues, even as personal income taxes bounced back some, and gross receipts taxes increased. 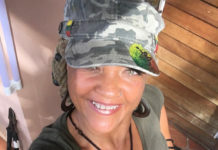 Today, they remain more than $100 million below 2008 levels, single-handedly accounting for most of the government’s almost $170 million annual structural deficit. 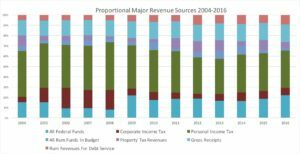 Gross receipts taxes are an indirect measure of business revenues, so why would they increase even as corporate income taxes did not? 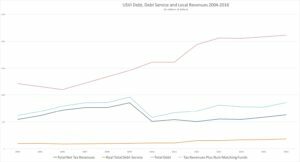 Debt, Revenues and Debt Service 2004-2016 – Click image for larger view. Most of the answer lies in the loss of the Hovensa refinery, which did not pay gross receipts tax as such on each gallon of gasoline and refined oil it sold, yet paid corporate income tax and had employees and subcontractor employees paying personal income tax. Its closure was a hammer blow to corporate income taxes, starting several years before the closure, as the refinery began losing money. But recent tax breaks through the University of the Virgin Islands RTPark played a smaller, yet still significant role, too. The RTPark has arguably reduced tax revenues with little development in exchange. Slot machines have almost no budgetary significance. Rum has generated new money, but at a high cost. 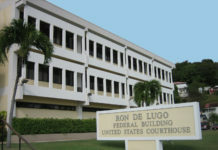 In 2009 and 2011 the University of the Virgin Islands RTPark gave near-total tax breaks to the territory’s three largest internet service providers: Broadband V.I. ; Choice Communications; and most of the Innovative entities, including their ISP, wireless telephone and cable television businesses. These are some of the biggest companies in the territory, removed more or less permanently from the tax rolls, with no fanfare or discussion in the media until long afterwards. The removals were briefly mentioned in a board meeting notice and minutes, posted on their now-defunct website, but nowhere else. RTPark officials made no mention of the action during multiple Senate hearings, press conferences and press releases in the several years after granting the breaks. When the V.I. Public Services Commission held hearings on transferring control of the Innovative entities in 2010, after former owner Jeffery Prosser went bankrupt, company officials were vague about whether they would seek tax breaks. At a May 2010 meeting, PSC member Verne David asked David Lilly, vice president of CFC, then-owner of Innovative, if the company had any plans to try to get V.I. government tax breaks. “Later in this year we will be evaluating whether EDC or some other program is appropriate. The previous program expired in August of 2009 so currently the company is not receiving any benefits. So we will evaluate it and let you know. At this time we do not know if we will,” Lilly answered. Shortly after the PSC approved the transfer, Innovative applied for tax breaks through the Economic Development Authority, aggravating some senators and PSC members who were surprised by the move. “As a PSC board member, I learned of Innovative’s application at Tuesday’s meeting; I remain adamantly opposed to using EDC incentives to correct poor, long-term financial planning, as those benefits were specifically designed to attract new businesses into the territory,” Sen. Louis Hill said in a strongly-worded letter to the Economic Development Commission in March of 2011. At the time, Hill was vice president of the Senate and an ex officio member of the PSC. The company soon after received the RTPark benefits instead. When Gov. John deJongh Jr.’s attorney general determined the tax breaks were not legal and ordered them rescinded, the Senate changed the law to make them legal. DeJongh vetoed the change to the law, and the Legislature overrode the veto after holding a special meeting to promote the override. 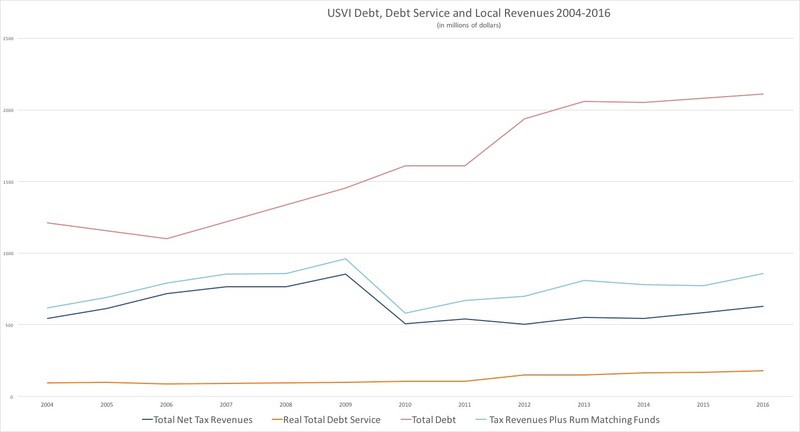 Officials with the previous administration have estimated the loss from those three companies at around $10 million to $15 million per year, based on historical tax receipts from them. That is far less than the $100 million permanent drop. But it is substantial. What direct benefit the RTPark has generated is hard to quantify, in part due to a lack of hard data suggesting direct benefits. In budget hearings in 2016, RTPark officials projected net revenues of $200,000 for the year, after expenses. It projected $2.38 million in gross revenue from RTPark “residents.” As of June 2016, the RTPark had zero tech companies actually in residence at the tech park, although 35 companies get tax breaks. Gov. Kenneth Mapp recently criticized the way the University of the Virgin Islands Research and Technology Park has removed taxpayers from the rolls without oversight and without evidence of new employment. In April, Mapp said he met with the RTPark director about a year ago, at which time the RTPark had given tax breaks to about 60 entities, including Innovative, Broadband V.I. and Choice. 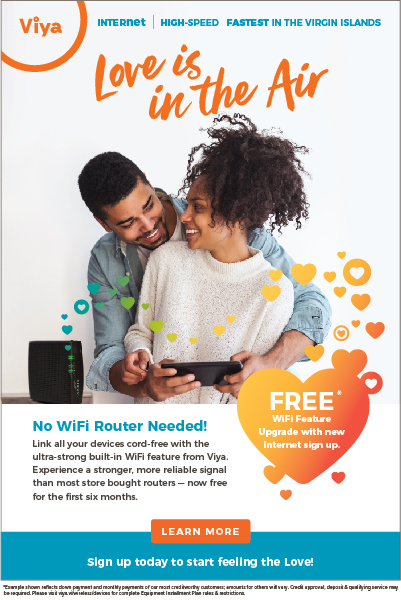 (Innovative and Choice are now one company called Viya.) Mapp said he asked how many people actually work in the Virgin Islands for companies receiving RTPark tax breaks, not counting those three pre-existing companies. The RTPark and Economic Development Authority were both created to attract new investment to the territory. During Senate hearings on the veto override, the local broadband companies argued that they had applied for the tax breaks in good faith, kept their end of the agreement, paying fees to the RTPark, and also needed the tax breaks to survive against competition. Accepting those arguments at face value, the tax breaks still did not serve their stated purpose of attracting new investment. Rather, they only insulate specific existing companies against potential competition from other providers. This is not a criticism of the companies themselves, which have a fiduciary duty to maximize profits for shareholders. That is what businesses do. But the V.I. government and the UVI RTPark are not in the same business. The government-owned, financed and licensed RTPark’s purpose was to generate a new technology sector in the V.I. economy and partnerships with UVI that further its educational mission. Any effort to rescind tax breaks is sure to be met with howls of outrage and similar lawsuits. But the Legislature has express authority from Congress to impose taxes, change taxes and give tax breaks. It may be in a better position to rescind tax breaks than would a subsidiary agency like the RTPark that does not have that express sovereign authority. That is ultimately a question for attorneys and courts. But when states impose new taxes, companies cannot sue to have them lowered, because the state has sovereign authority to tax. When Congress changed the way tax breaks impacted pharmaceutical companies in Puerto Rico, companies did not sue Puerto Rico for the loss of tax breaks. When the IRS changed the rules for V.I. EDA tax break residency requirements in 2004, companies were not able to sue the territory or Congress for taking away their tax breaks. The sovereign actions of the government are distinct from the contractual agreements of an incorporated entity owned by the government. Congress could also step in, but may not be likely to, in the near term as the current governing majority and president are broadly in favor of corporate tax breaks. Meanwhile, whether or not tax breaks are an effective strategy for creating real economic development, a matter of some dispute among among economists, in fact, the UVI RTPark has not, to date, created a thriving technology sector and appears to have removed far more tax revenue from the government’s coffers than it is attracting to it. Next: Part 7 What About Horse Racing and Casino Gambling?